Fertile, well-drained soil, or use containers. Limited. Lobelia can take cool weather but is easily damaged by frost. Alyssum. Lobelia varieties that bloom blue are wonderful cascading flowers to combine with petunias or other easy annuals in containers. 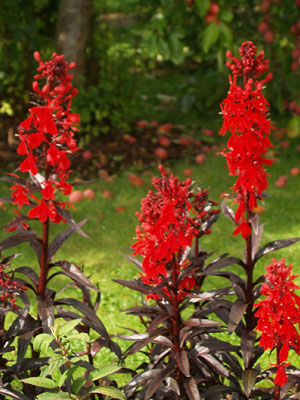 You also can use lobelia to edge beds because of its small size. Sow tiny lobelia seeds indoors, on top of moist seed starting mix, and provide very bright light. Most gardeners buy lobelia seedlings, which are widely available as bedding plants in spring. Lobelia is a great cool-season flower for adding vivid blue to the garden. Some varieties bloom white or pink. In early summer, pinch back plants to stimulate the growth of new blossom-bearing branches. High heat can cause lobelia to suffer, but the plants stay in bloom for many weeks in areas with cool nights.